As we flip calendar years I am delighted (even if I'm not really surprised) to learn that I am being renewed as both a Regional Director and an MVP (for C++.) These two programs are both a big part of my professional life. (The RD program is more exclusive, with only 120-140 RDs around the world compared to thousands of MVPs, but the two programs serve different needs, of course.) They each provide me with amazing information and access to the product teams. They open doors for me throughout the Microsoft-oriented world. 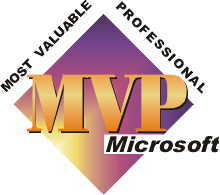 Most of all, they introduce me to other RDs and MVPs around the world... an amazing team to feel part of. I am also still a user group leader, a member of the INETA North America and MSDN Canada speaker bureaus, and of course I have a business to run with clients throughout North America. In not-unrelated news, I qualified for Elite on Air Canada and almost halfway to Super Elite. The previous year I just squeaked to Elite... wonder how much flying 2006 holds for me?